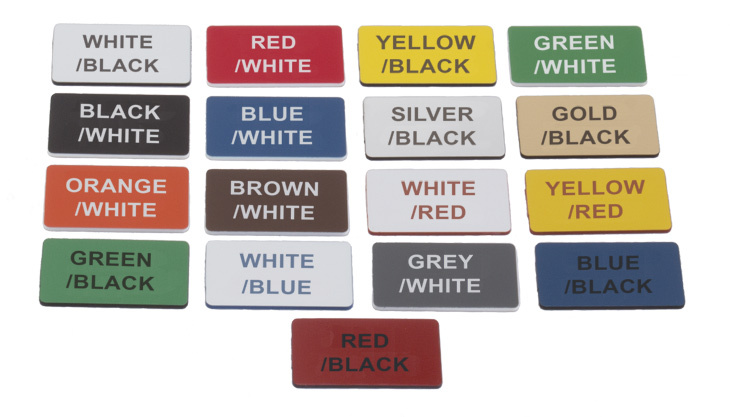 Our engraved signs and cable markers in ABS can be ordered in lots of different colours. It gives you the opportunity to mark your installation as you like. All colours, except for silver and gold, are UV stable and can be used outdoors without any impact from the sun. You can use gold and silver outdoors as well but the colours may fade a bit after 5-10 years. But the readability will always remain! The pictures here show all the combinations you can choose from in the web tool. Colour reproduction is always difficult but this will give you an idea of how the colours actually look.